There is a BIG HUGE shop update coming soon! Come back on April 24th to see brand new items. Yes, there will be new Mother's & Father's Day cards, and Bday cards! And Miss You cards! Cross your fingers for sticker sheets! It's been a heck of a long time since I've released new designs, and I'm so excited to share them with you. Perfect for her love of pugs! 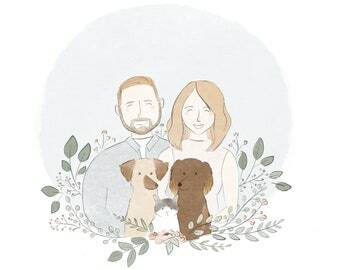 My bride-to-be-friend absolutely loved her family portrait! Beautiful work and Tessa is an extremely kind, talented, and all-too-patient (especially with my oopsie of a last minute change after already approving it!) shop owner and artist! I got so much love for this portrait! If you've been thinking about getting a portrait done, now is a great time to place an order. Come check out the listing details & photo samples of past portraits to get an idea of what you might like! 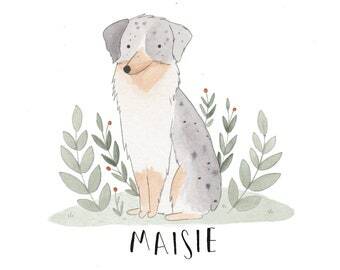 Tessa is the self-taught creator & illustrator and shop runner behind Fox & Bear. Thank you so much for taking the time to see how I run Fox & Bear Paper Co. I am a self-taught illustrator working out of my home in Eugene, OR. I've been designing stationery since 2015 and feel so lucky to have received such a great response. If you have any questions for me, or if you would like to carry my product in your brick & mortar store, feel free to email me at foxandbearpaper [!at] gmail.com. If you have an issue with your order please contact me via Etsy Messaging as soon as possible. You can also reach me via email at foxandbearpaper [!at] gmail.com I'm happy to see what can be done to ensure you have a positive experience with my work & product. Custom or personalized orders cannot be returned or exchanged. Should a problem arise, I may agree to refund a portion of the amount paid and cancel the order. Under no circumstances will I provide free illustration and portrait refunds will always be accompanied by order cancellations. I am not responsible for lost or mis-delivered orders. If your order is lost or delivered to the wrong address, I'm happy to resend the item(s) at a reduced repurchase rate. If you receive an incorrect or damaged item, please notify me immediately so that I may correct the issue and replace your order. I ship all non-custom orders via USPS First Class Mail. Typically orders take about 1-3 days to ship, and 3-5 days to be delivered depending on your location within the US. You are welcome to upgrade your shipping to Priority Mail, which takes about 2-3 business days to be delivered. International orders are shipped via USPS First Class International. Please double check your shipping address before checkout to avoid delay or errors in delivery. If you have questions or an issue with shipping, please contact me directly. I am currently accepting custom order requests. Feel free to contact me with your ideas so we can create something special together! I am happy to wrap your order as a gift and include a personalized note at no additional cost if needed.